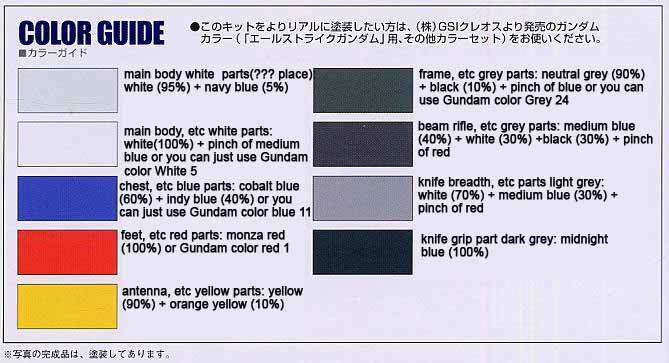 Color Guide for the Perfect Grade 1/60 Strike Gundam was translated from Japanese to English. I can't really say much about the Strike Gundam because I've had no experience watching the first Gundam Seed series. I've watched Gundam Seed Destiny though and found it entertaining. Would sure love to see though what it feels like to build a perfect grade Gundam. The perfect grade line is said to be the epoch of plamodel construction because of the articulation and sheer amount of parts. Not to mention, I like it also because its a big 1/60 scale model kit. There was a slight problem encountered though during the translation as there are two white colors for the main body and the kanji explanation for its difference was not discernible with the copy taken from Hobby Search. If anybody can give me a clearer copy, I'd be happy to rectify this error. 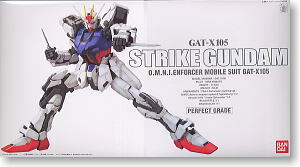 The PG Strike Gundam costs 14000 yen at Hobby Link Japan, 14000 yen at Hobby Search and $$$$ at Amazon 3rd party sellers. Anyway, here's the Translated Color Guide.